euroclamp is proud to inform you that MV10x-10,16-V, MV10x-12,7-V and MV10x-20,32-V series were recognized by VDE laboratories to withstand higher current level. They are now approved for 70A current. MV10 series can perform higher ratings than competitors. With a lot of novelties the new euroclamp website will follow you in a step-by-step tour to find wich products your are looking for. The new graphic interface allows a simple and intuitive navigation, with detailed content for each product. 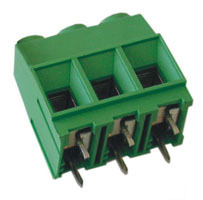 SINGLE DECK and MULTI DECK TERMINAL BLOCKS, PLUG-IN CONNECTORS, SCREWLESS TERMINAL BLOCKS AND PLUG-IN CONNECTORS, PANEL FEED-TROUGH TERMINAL BLOCKS, ACCESSORIES and HOUSINGS. 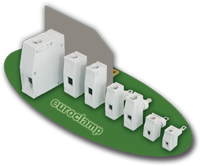 Established in 1975 as a specialized relay socket manufacturing company, we launched the euroclamp product range in 1991 offering technologically advanced quality connectors and electronic housings. Today we are recognized as a flexible, reliable and highly innovative partner for domestic and international customers. Our design and production capability gives us the possibility to offer comprehensive and cost-effective solutions which includes custom desing-in also in small and medium sized production runs. The whole production process from designing to final assembly and packaging including the production of spare parts, is located in the modern factory at the headquarter in Montaquila – Italy, between Rome and Naples. International sales support is provided through a wide net-scape of distributors covering more than 20 foreign countries.